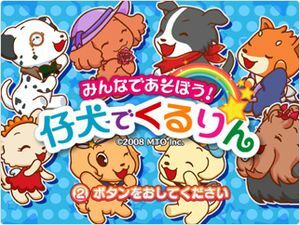 The actions of cute puppies are super fun in Minna de Asobou: Koinu de Kururin (みんなであそぼう！ 仔犬でくるりん)! A refreshing action puzzle game! The rule is very easy. Just "turn around and connect"! Put a colorful puppy piece falling from above into the same color dog house and score. The graph below charts the compatibility with Minna de Asobou: Koinu de Kururin since Dolphin's 2.0 release, listing revisions only where a compatibility change occurred. This page was last edited on 4 March 2018, at 04:07.